Last time, we talked about priests. In our second post on the upcoming balance changes, we’ll be covering racial skills. A common bad feeling in the early campaign was a dearth of great racial skills. You get that racial slot and its bad cards weaken your deck. You go several levels before you can even begin to recover your average card effectiveness. Often the best option has been an item with a trait Handicap for cycling purposes. Displeased with this, we set out to determine what was or wasn’t playable among racial skills. Below are changes and additions designed to make the majority of racial skills at least potentially interesting. Humans needed the most work. Their skills were rife with Walks and Runs, and a lot of their higher-rated cards were gold filtering cards with net 0 card advantage or team moves, which are great in multiplayer but often unimpressive in the campaign. We decided the vanilla movement cards had to go, so we replaced them. Block, Soldier! replaces Cautious Sneak. Advanced Guidance Uncommon 6 Block, Soldier! Attack, Soldier! Attack, Soldier! You’ll notice that for the most part, these are low-level peasant items, designed to be decent alternatives in the early campaign. These items will be added to the game without replacing any existing items. • Battlefield Training and Advanced Battlefield Training now have Cantrip. The former joins the latter at range 6. • Desperate Block blocks fewer things more of the time: 66% chance to block any damage 6 or more. • Retreat now allows the character playing it to move as well. • Shuffle, Team! has traditionally been overvalued; we’re reducing it to a bronze card, which lowers the levels of all items it’s on. • Lateral Thinking is no longer a joke card. • Forward Thinking is now a trait that increases hand size. 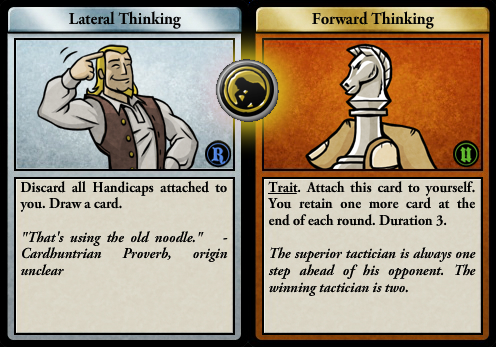 • Speaking of thinking, there’s a new legendary in town: Focused Thinker, which gives you three Lateral Thinkings for a major token. Dwarves overwhelmingly had the highest percentage of racial skills that were totally viable both in campaign and in multiplayer. We just gave them two more tokenless peasant skills to round things out, and made no changes to any of their other stuff. Oh, elves. You magnificently squishy folk. Since our changes to control cards, elves have become much more viable in multiplayer, but they still had some of the absolute worst racial skill items. Tons of these items were laden with vanilla movement cards that did not synergize in any way with the elves’ already high base move speed, giving elves more of what they have and none of what they need. Mobility is still the theme of elves, of course—so we looked into giving them more interesting mobility. For starters, we took all the Dashes and Runs and Walks and Cautious Sneaks out of the picture. Skip, designed by player Stexe for the Monster Hunt league, replaces Walk. Scouting Run replaces Cautious Sneak. Smashing Spin replaces Run and Dash. Overall, these changes don’t decrease elven mobility—they just add some flair to it. We also gave a discount to Dodge on elf skills, as well as Violent Spin and Muscle Through, which will be replacing some Jump Backs and Energizing Moves. Elves should reign when it comes to positioning, and it was a mistake not to give them these cards all along. We also increased Jump Back‘s movement to 2 from 1. Lastly, we saved elves from their own cowardice. The fair elves are craven no more, as Cowardly has been completely removed from their stable of skills. • Replaced Cowardly with Loner on Untrained Insight. • Replaced Cowardly with Fright on Pacifist Trickery. • Replaced Cowardly with Superstitious on Novice Insight. • Replaced Cowardly with Trip on Footwork. • Replaced Cowardly with Fright on Frightened Scouting. Overall, we hope these changes will make elves more interesting both in the campaign and in multiplayer. We’re really excited to say that there are many fewer boring or terrible skill items in the game with these changes, and while there isn’t a totally flat power curve, we expect you’ll find a lot more real options at various stages of the game. That should about cover it for racial skills. I agree on all the problems, but I’m not sure these go far enough for multiplayer. Lateral Thinking goes from a hilariously terrible joke card to actually interesting niche card but is still a very niche card. The two battlefield training cards look dramatically more effective than anything positioning the elves have (and even then I’m not sure they are worth it). Forward thinking sounds cool, but I suspect in practice it will simply up the profile of punishing cards. I’ve been wanting a “super desperate block” for a while now to combat OB bursts. This is a step in the right direction, but I was hoping for a 2+ block that only triggered on 9+ attacks. The two peasant dwarf items look great for early campaign play! What I wanted to see was a teleport cantrip move exclusive to elf racials or perhaps a card that disallows any opponent from targeting an elf if they free spin before an attack. Overall I don’t think set of changes this will help multiplayer elves much and will only help human warrior builds. I really like the early single player racials. However you did magnificently in the last round of balances so I’m cautiously optimistic. Another possibility that I’m amazed hasn’t been tried is adding Disorienting Block to elf racials. The card is quintessential elf and rather hard to come by, especially if you are an elf wizard. Maybe Lateral Thinking could turn Handicaps into a benefit somehow, rather than just discarding them? That would certainly fit its theme, and could make for some interesting builds.